Hair Care Panda is a unique brand, which is worth having in your offer! Why is it worth to cooperate with us? We are one of the few companies that manufacture hair vitamins in the form of gummies, which are suitable for vegans. Customers recognise the Noble Health brand, which is associated with high quality. This guarantees you that you sell products which are made with the best possible ingredients. We are present on the market since 2009. Noble Health is a solid business partner, which knows how to create convenient cooperation conditions. 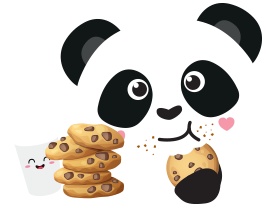 Why is it worth to have such a brand as Hair Care Panda in your offer? The brand has a strong promotional support in many different channels, especially in social media. The brand is known and loved by influencers (bloggers, Instagrammers) that is why it is recognised, loved, and sells great. HairCarePanda is a competitive advantage and a novelty on the market! Be up to date and take advantage of various promotions! Thank you for joining the HairCarePanda Lovers Club! You've just received an e-mail with a little surprise! Does Hair Care Panda Vegan Gummies really work? Of course! It's like asking: do you want to have beautiful and healthy hair? How does this magical composition of Hair Care Panda Vegan Gummies work? Each ingredient in the VEGAN SUPER Biotin Complex™ formula is super important. Every one of them was carefully selected to improve the condition of your hair and skin. Biotin helps maintain healthy hair and skin. Niacin helps maintain healthy skin. Vitamin B6 regulates hormone activity. Vitamin A helps maintain healthy skin. Selenium helps maintain healthy hair. Vitamin E protects cells against oxidative stress. Zinc helps maintain healthy hair, skin, and nails. Pantothenic acid is responsible for the proper synthesis of vitamin D. Vitamin B12 lowers the feeling of fatigue. Thiamin supports the proper heart functioning. How to use Hair Care Panda Vegan Gummies? We know that Hair Care Panda Vegan Gummies are delicious, eating them is a pure pleasure, but we strongly recommend you to eat only 2 gummies a day. Treat them like any other gummies, remember to chew them well before swallowing. That's it! You do not have to wash them down with water, like all the other unpleasant capsules or tablets! How to store Hair Care Panda Vegan Gummies? 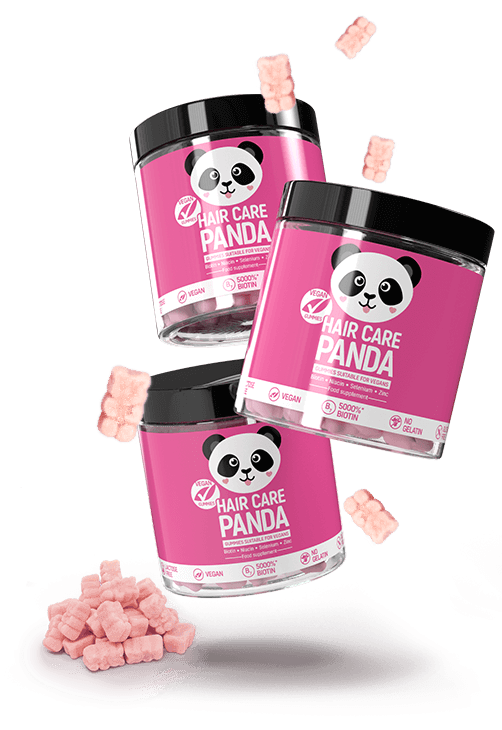 Hair Care Panda Vegan Gummies formula is extraordinary and requires good treatment. You should store the product at room temperature away from direct sunlight (e.g. on a cabinet). Pandas are not fond of high temperatures, same goes for vitamins and minerals. Food supplements should be kept away from small children. How many magical gummies are in a Hair Care Panda Vegan Gummies package? One Hair Care Panda Vegan Gummies package contains about 60 magical gummies, the total net weight of the product is 300 g.
Can children eat the magical Hair Care Panda Vegan Gummies? We realise that the tasteful appearance, as well as the delicious taste of Hair Care Panda Vegan Gummies, may suggest that it is suitable for everyone, however, Hair Care Panda Vegan Gummies is a product dedicated only for adults due to the high amount of active ingredients. What are the ingredients of Hair Care Panda Vegan Gummies? Ingredients: glucose syrup, sugar, modified tapioca starch, modified potato starch, mixture of vitamins and minerals (zinc gluconate, dl-alpha-Tocopheryl acetate, nicotinamide, calcium D-pantothenate, retinyl acetate, sodium selenate (VI), cyanocobalamin, D-biotin, pyridoxine hydrochloride, thiamin mononitrate, pteroylmonoglutamic acid); acid: citric acid, acidity regulator: sodium citrate, aromas, fruit and vegetable concentrates: tomato, radish, apple, pumpkin, colourant: titanium dioxide. Nutraceutical only sounds scary ;) It is a food supplement, which thanks to minerals and vitamins supports the proper body functioning - including hair care.